At Saffola FITTIFY Gourmet, we believe in adding more nutrition to your food and more flavour to your life. With this motto, our range has been carefully created by nutritionists and curated by celebrity chef Kunal Kapur to combine the best of taste with health for a slimmer fitter life. Healthy-Gourmet is now a reality! A healthy and delicious shake scientifically formulated by nutritionists with a blend of best in class whey and casein protein (PDCAAS 1) to support lean muscle build up. It also contains dietary fiber, 26 vitamins and minerals and 5 superfoods to help you manage weight effectively for a slimmer fitter life. When replaced with one regular meal, you end up consuming upto 70% less calories vs. an average Indian meal with 50% of daily vitamin nutrition as per the recommended daily allowance (RDA). The Hi-Protein Slim Meal Shake is available in 7 delectable flavours namely Swiss Chocolate, French Vanilla, Cookies & Cream, Coffee Caramel, Royal Kesar Pista, Pistachio Almond and Alphonso Mango. The Cookies & Cream and Pistachio Almond flavours in fact have no added sugar. 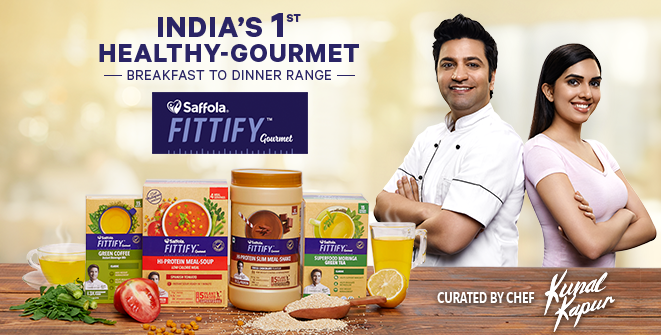 Saffola FITTIFY Gourmet Hi-Protein Meal Soup is a delicious low-calorie meal scientifically created by nutritionists and curated by chef Kunal Kapur in exotic flavours from across the world. It is a healthy blend of best in class protein (PDCAAS-1) to help you build lean muscle. It contains dietary fibre, vitamins, minerals and 5 superfoods to help you manage weight effectively for a slimmer fitter life. Compared to regular powdered soups it has upto 10X protein, upto 10X fibre and 26 vitamins and minerals to give you nutrition like a meal. The Hi-Protein Meal Soup is available in 3 flavours namely Italian Mix Veg, Mexican Sweet Corn and Spanish Tomato. The Superfood Moringa Green Tea is available in 6 flavours namely Classic, Honey Lemon, Jasmine, Lemongrass, Moroccan Mint and Royal Kahwa.